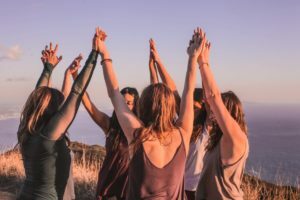 A 6 month in-depth journey for women who want to feel more ALIVE, deeply nourished, and are looking to go deeper with your embodiment practice. Learn how to bridge the presence, peace, and vitality you experience in your practice with your whole life – bringing that connection into your relationships, your work, your day-to-day tasks. The same small group of women meets together for a mini retreat twice a month, for 6 months. Circles are small groups of 6 to 12 dedicated women. Over the course of each circle, there is time for sharing, guided Amba practice (fluid movement, feminine yoga, dance, breath work, sound, partner exercises, and deep nourishment earth meditation). 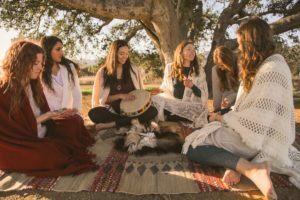 Amba Circles are for women who want to go deeper and access the full range of embodiment through deepening your connection to your body, heart, and essence. In Amba, you’re guided to explore and embody all 3 aspects of the feminine: sacred feminine (your essence), wild feminine (your body) and loved feminine (your receptive heart). The Amba Circles are for women who are ready to develop more consistency or richness in their practice and are seeking to weave the depth of connection found in these circles through their whole lives. 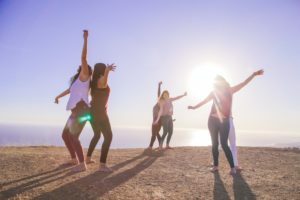 This is a program for women of all ages who crave the community of authentic, supportive movement practice. 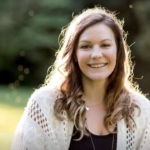 Amba Embodiment Circles are the only year-round, ongoing Amba program in which you can work in depth with Meghan Morris aside from her 1:1 Embodiment Coaching. The steadiness of regular practice is key to learning how to live in the consistency of nature’s rhythms, and allows you to go deeper over time. We are constantly jumping out of ourselves in our modern culture – jumping in and out of relationships, practices – and because of this, we can miss out on the richness and depth that we can get from going deeper into ourselves. Meghan trains you to go deeper into the universe of your body, and to keep finding deeper gems within you. This process is like nature: It takes time. This year in the Amba Circles has been hugely transformative for me. I feel more connected with myself, more in alignment with myself. I had set out intentions for myself and I realized I actually have reached them. The tools that Meghan has given me has allowed me to reach those goals. And hearing the shares of all of the women in this group what they are going through and how things are affecting them is just so powerful. I can’t wait for these classes each week. I have this thirst for this practice, I can’t get enough! it just makes me feel so good inside. Our next session of Amba Embodiment Circles begins July 2019. Sign ups begin in May of 2019. Email us and share a little bit about yourself, and why you’d like to join a circle. Please indicate which circle(s) you’d like to join. Each cycle, a limited number of spaces open up in some of the circles. We cannot guarantee your spot in a circle, but we will try our best to accommodate you. What do you do in an Amba Embodiment Circle? Embodiment Circles begin with an opening practice that usually includes breathing, meditation, and setting your intention. You’re then guided through an Amba Embodied Yoga/Movement/Breath Work journey. Each circle will be custom crafted based on the women in the circle, the phases of the moon, and the seasons. Every circle ends with quiet time for writing or meditation, and a sharing circle at the end. … crave a regular space in which to nourish and connect to the heart of life, within your body. … desire to feel your powerful and radiant feminine energy on a more regular basis. 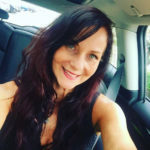 … want to live your life from a balanced place, connected to your truth, and in sync with your nature. … want to feel at home in your body and comfortable the skin you’re in. … wish to feel grounded, steady, full of vital energy, and at ease. 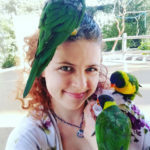 … want to learn how to bring the presence and connection you experience from your yoga/movement/meditation practice into your relationships, work, and daily life. Earth & Fire Element focus for building vital energy, cultivating fluid strength, and tapping into the source of power and passion within you. Water & Air Element focus for deep nourishment, replenishing your life force, and opening up to the sacred, receptive feminine energy in your body. Amba Circles are a 6 month journey with the same group of women. Our current cycle runs July-December 2018, and is full. Our next session begins January 2019, with enrollment open in October. Please fill out the form below to inquire. 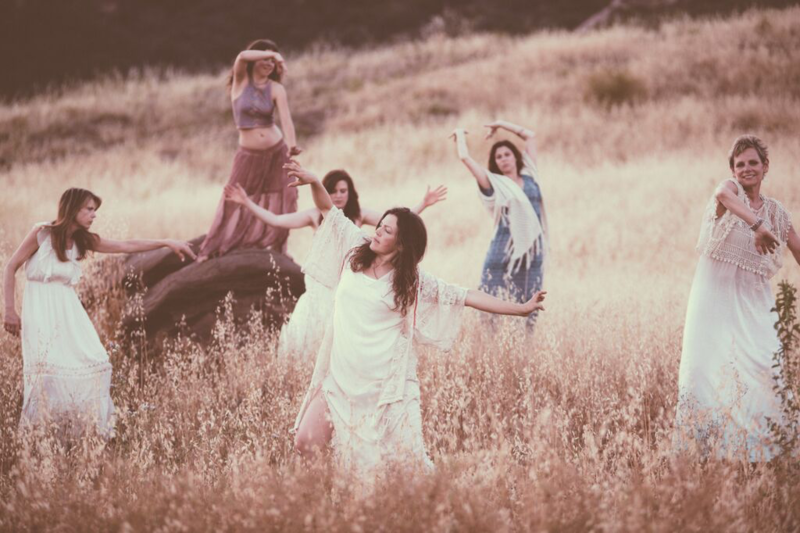 Meghan leads Embodiment Circles in Topanga Canyon and online. 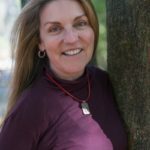 When I first learned about Amba I was experiencing a complete disconnection from my body. I tried different kinds of yoga and it wasn’t doing it for me. Amba made me feel like there was hope. I didn’t realize how much lack of connection I had, until now. In my relationships, I’m much calmer and much more open to connection with others. I didn’t realize that my lack of connection to my self was also translating to a lack of connection with other people. I’ve also found I’m more sensuous. Overall, it’s increased my vibrancy, enthusiasm, and energy. You will learn dozens of practices based on the 5 tools of the Amba system: Breath, movement, sound, touch, presence. 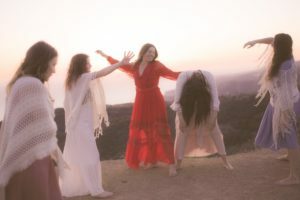 Invitation to Amba Embodiment Circles party with live music, in which all of the women of all circle are invited to come with their partners or families and connect to our larger Amba community. Make Ups for missed circles: If you miss a session due to being out of town or an emergency, you can make up 4 circles per cycle in a different group. Make ups must be completed within the 6 month session. Amba Yoga helps me to align my body, mind, and spirit so that I can be present in my heart, and more accurately express it to the world. When I’m able to do that I’m able to more fully live my purpose. Being able to move and flow with my body brings me an amazing joy that I have been longing to share with the world. Since doing Amba Yoga I feel more at peace, alive, and I have an amazing love for myself that I did not know was possible before. To inquire about the Amba Circles program, please fill out the form below.